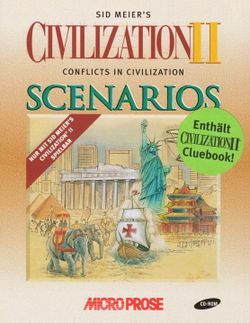 The Conflicts in Civilization Scenario CD is an expansion for the Civilization II game, released by MicroProse at the end of 1996. The expansion features 20 scenarios. 12 of the scenarios were created by MicroProse and the remaining eight were selected from the "Best of The Net", in an effort to supply players without internet access a chance to see some of the player-made creations. The expansion updates the original copy of Civilization II to the version "civ262" patch. This page was last edited on 10 January 2010, at 21:03.